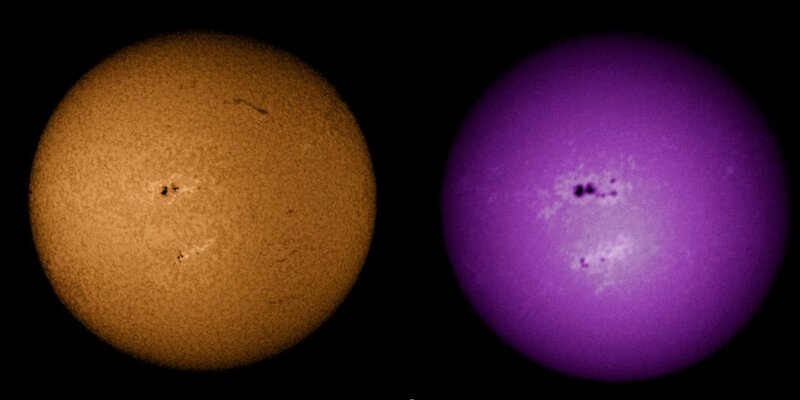 Comparing hydrogen alpha views and ultraviolet views of the Sun on February 2nd, 2014. The large sun spot groups appear different in different types of telescopes. The UV sunspot grouping is over 186,000 miles across. This animation shows the rotation of the solar storm in hydrogen alpha wavelengths. This is the storms third appearance since being spotted in December. The large solar flare at the upper right is over 70,000 miles tall. This picture was taken on January 29th, 2014. Comparing visual views, hydrogen alpha views and ultraviolet views of the Sun on January 5th, 2014. The large sun spot groups appear different in different types of telescopes. Movement of the solar storms as they appear to move down after one day. This picture was taken on January 6th. The solar storms continue their trek across the Sun on January 8th. The journey continues as the Sun rotates on January 9th. 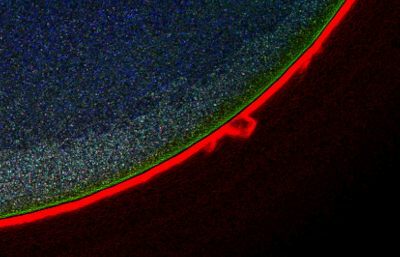 Comparison of the movement of the solar storms using the Lunt 60mm CaK telescope. This telescope sees in the ultra violet wavelength. The solar storms are near the edge of the Sun on January 12th. 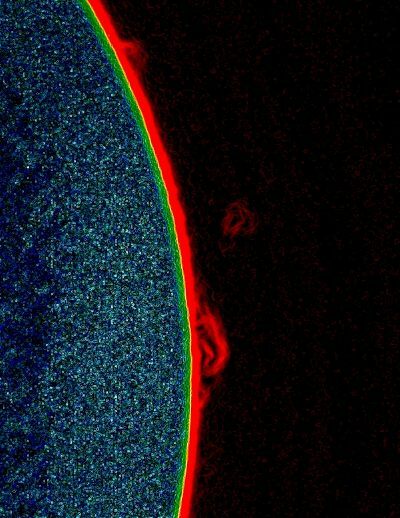 Clouds obscure the surface of the Sun and this view thru a glass solar filter hides the eruptions and violent nuclear storms that occur on the Sun. Taken with 80mm Orion Refractor, Orion Glass Solar Filter and Canon XSI DSLR. November 18th, 2012. The clouds move away and expose the spots on the surface of the Sun. November 18th, 2012. This major solar flare is more than 80,000 miles tall and over 100,000 miles wide. It was short lived and dissipated in a couple of hours. 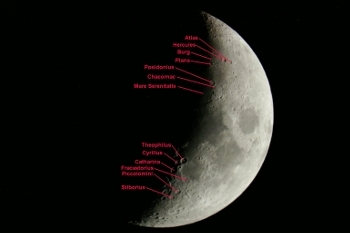 (See below) Taken with a Lunt 60mm Ha Pressure Tuned telescope and a Canon XSI (450D) camera. November 18th, 2012. After about two hours, this is all that was left of the massive solar flare. 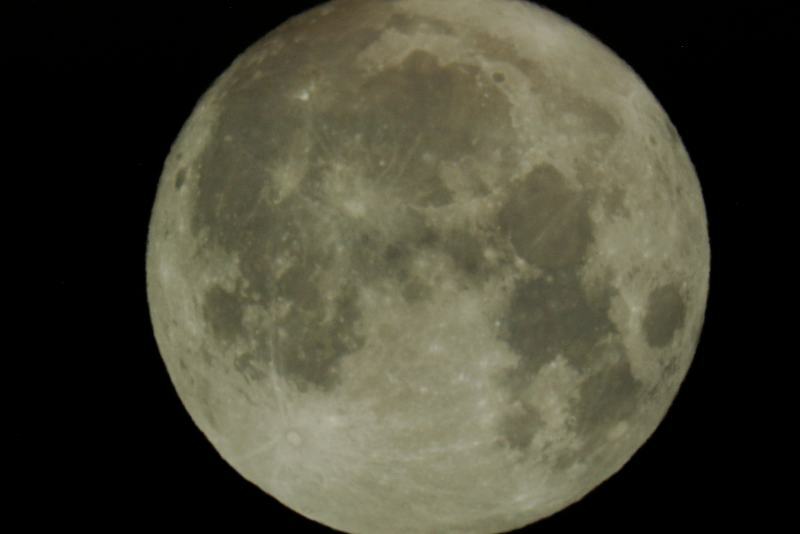 Taken with a Lunt 60mm Ha Pressure Tuned telescope and a Canon XSI (450D) camera. November 18th, 2012. Solar activity is starting to increase as Solar Cycle #24 continues. 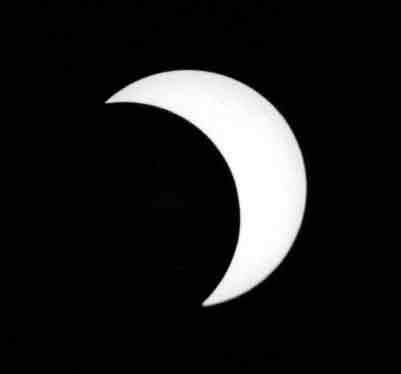 This picture was taken with a Celestron telescope and solar filter April 23rd, 2012. 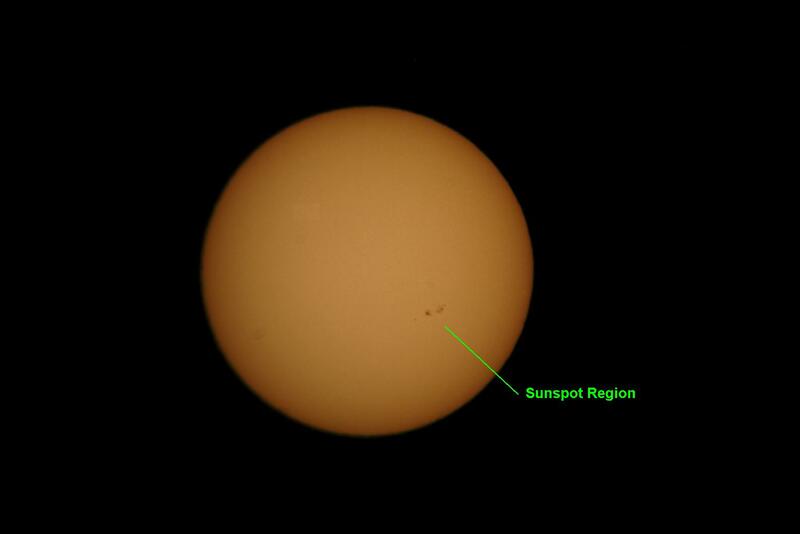 Several sunspot groups are showing up for the week. Solar activity is starting to increase as Solar Cycle #24 continues. 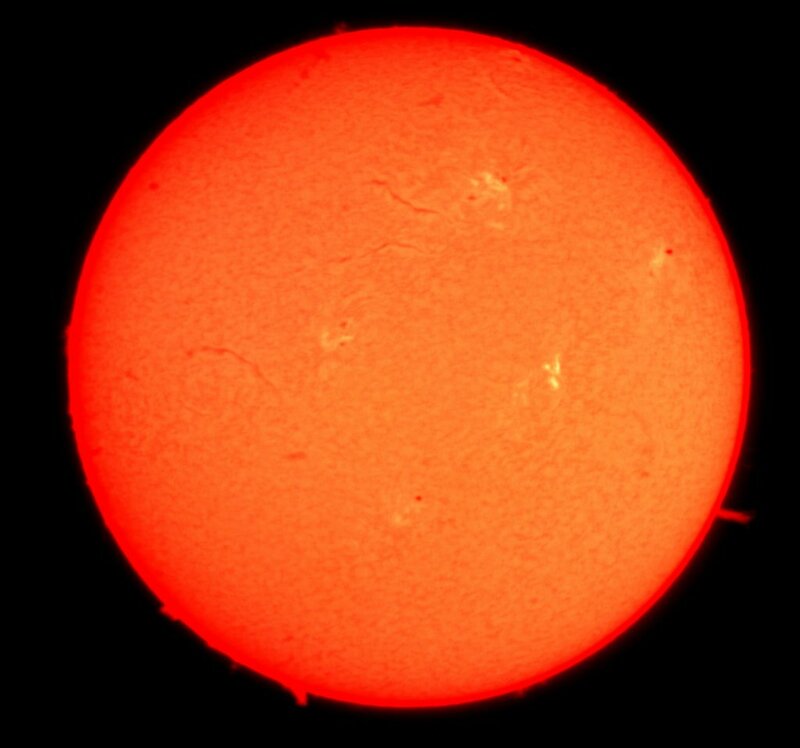 This picture was taken with a Lunt 60mm Hydrogen Alpha telescope dedicated for solar viewing on April 23rd, 2012. Solar activity is starting to increase as Solar Cycle #24 continues. This picture was taken with a Lunt 60mm Hydrogen Alpha telescope dedicated for solar viewing on January 1st, 2012. 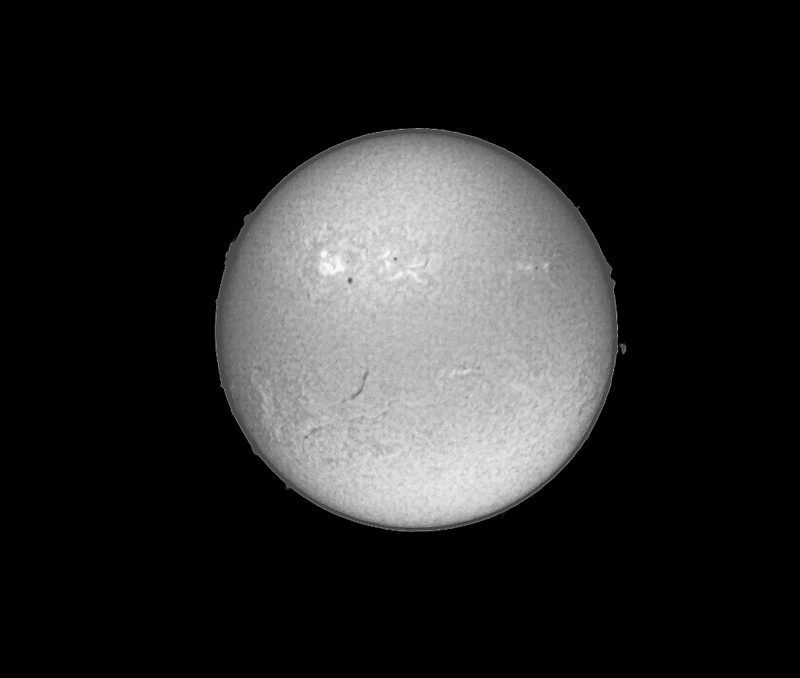 The monochrome image shows up a lot of activity on the surface of the Sun. Solar activity is starting to increase as Solar Cycle #24 continues. 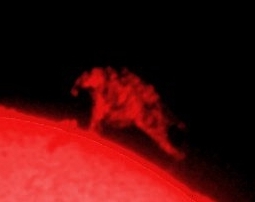 This picture was taken with a Lunt 60mm Hydrogen Alpha telescope dedicated for solar viewing on November 27th, 2011. Solar activity is starting to increase as Solar Cycle #24 continues. 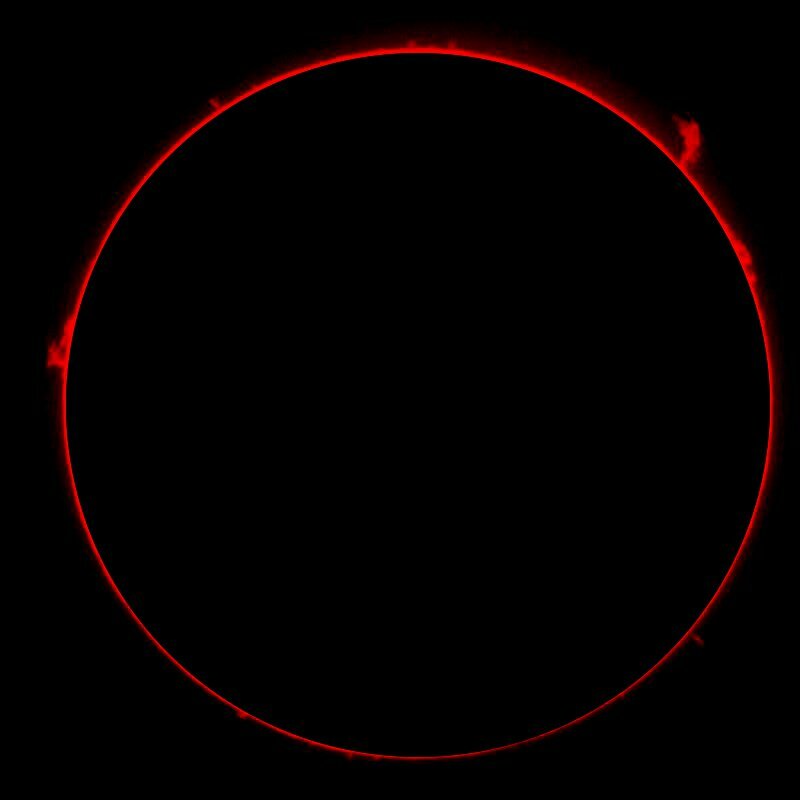 This picture was taken with a Lunt 60mm Hydrogen Alpha telescope dedicated for solar viewing on August 6th, 2011. 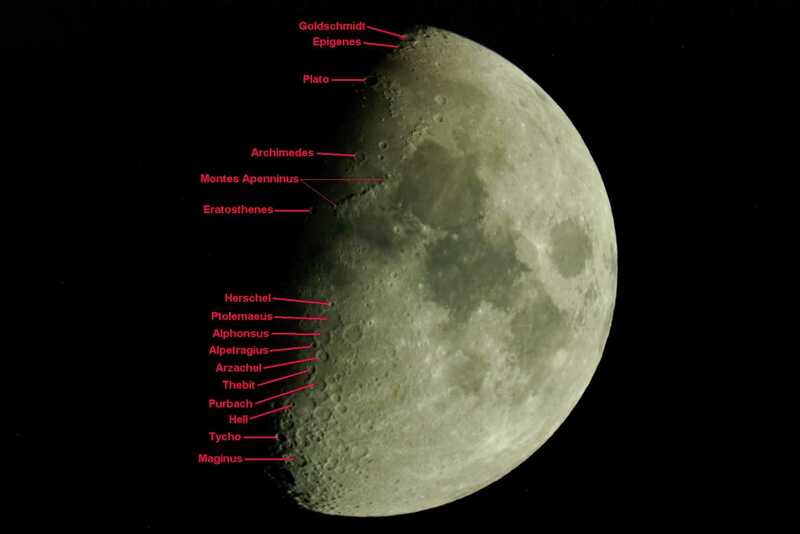 The Moon is usually small enough to fit into the frame of the camera. But, in March it was at is closest in quite a while. It was a mere 218,000 miles away. 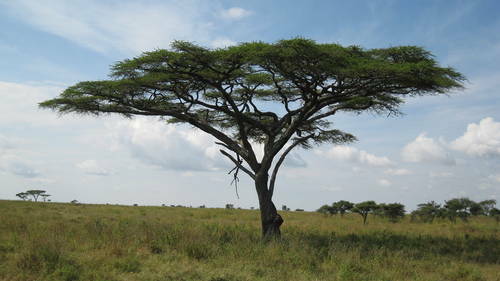 Its normal distance averages about 230,000 miles. Through its elliptical orbit, it occasionally will venture closer as it did in March. 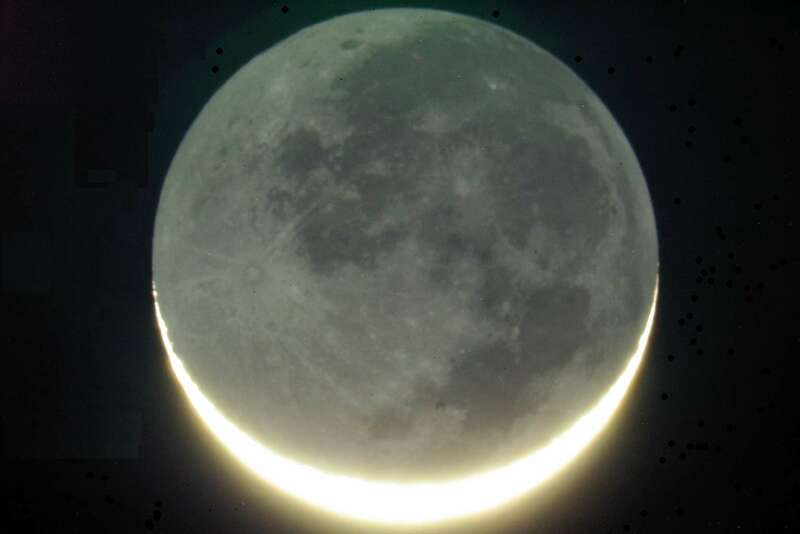 This composite shows that the Moon does really change its size as it goes through its orbit. 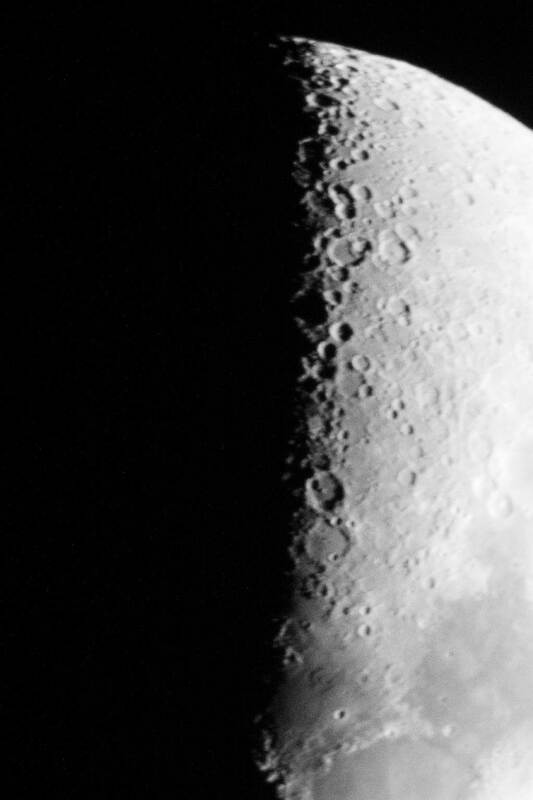 On the left, the Moon was about 218K miles away. On the right, the Moon is about 240K miles away. 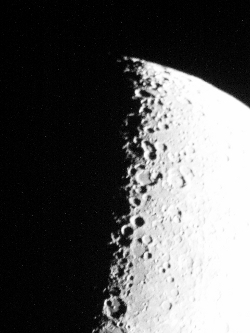 On occasion, the Moon will go as far as about 251K miles away making it a bit smaller in aspect to the camera. Sunspots are returning in Sunspot Cycle #24 after a long overdue hiatus. This Sunspot was taken on March 13th, 2010 thru a 6" Pierre Schwar hand built telescope owned by Karen Maddy with an Orion solar filter. Pentax DSLR par focal with a 20mm eyepiece. 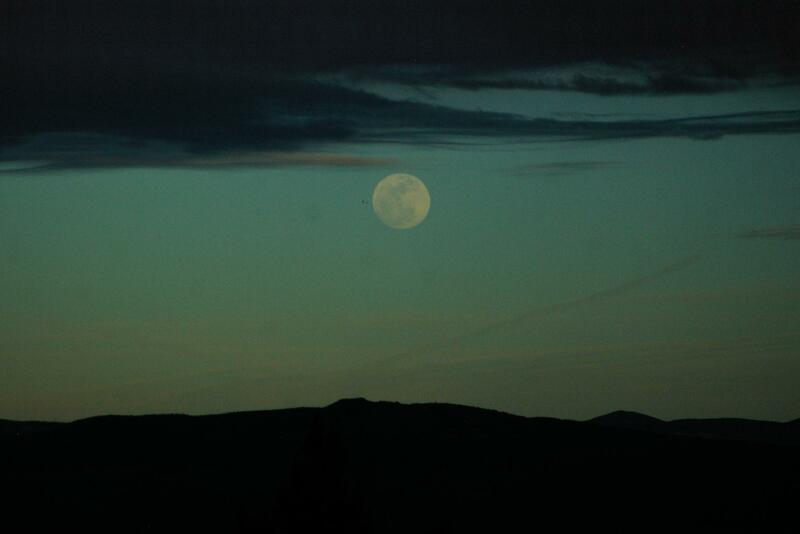 An eerie full Moon is about to disappear into the clouds on February 22nd, 2010 taken from the Mescal Spur Observatory, Clarkdale, AZ. Pentax ist*D DSLR and 70-200mm zoom lens. F4, 1/4000 sec exposure @ ISO800. Earth shine on a two day old Moon on March 17th, 2010 taken from the Mescal Spur Observatory, Clarkdale, AZ. Prime Focus with a 6.3 focal reducer attached to a Celestron GPS11, Pentax ist*D DSLR 4 sec exposure @ ISO800. Some hot pixels are visible as a dark frame was not subtracted. Camera: Pentax IST * D.
1/2 second at F4. ISO 800. 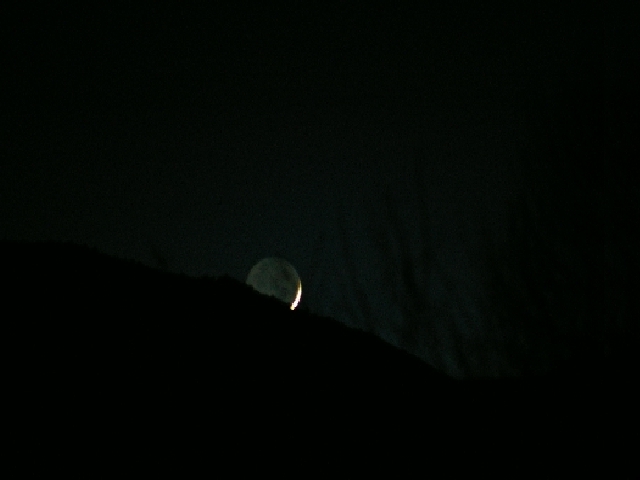 Earth shine on the Moon as a 1.7 day old Moon falls over Mingus Mountain. Scope: 10" LX 50 Meade. Exposed parfocal with 2" 50mm University eyepiece. Camera tripod mounted. Auto exposure. Film: Ilford XP2-400 Black & White C41 Process. Prime Focus with 6.3 Focal Reducer. 1/400 Sec exposure. ISO 800. 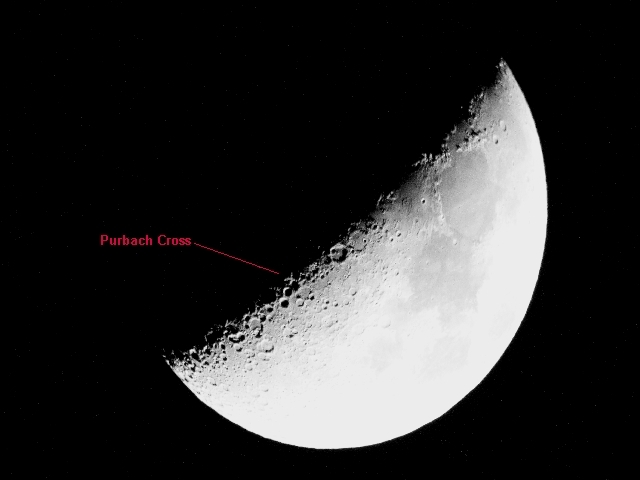 The Purbach Cross or Werner X is visible some months at about a six day old Moon. 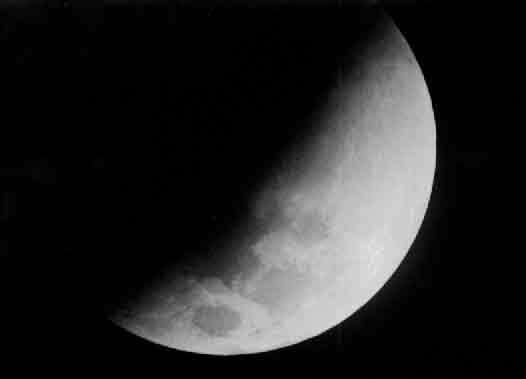 Shadows from adjacent craters cause the X to show. Parfocal shot with Hyperion 24mm. 1/200 Sec exposure. ISO 800. Parfocal with Hyperion 24MM. 1/200 Sec exposure. ISO 800. Parfocal with Hyperion 24MM. 1/8 Sec exposure. ISO 1600. 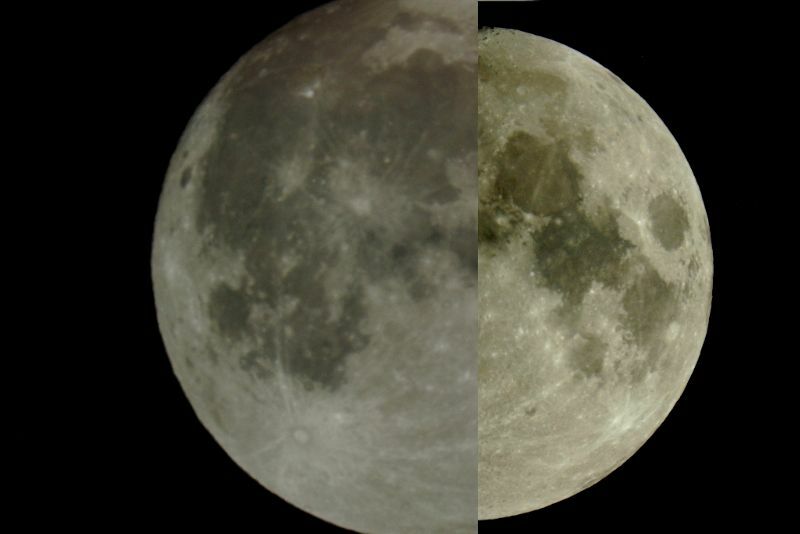 As the Moon ages every day, the features along the shadow (terminator) also change. This is a 6 day old Moon. Camera: Pentax IST *D Exposure: 1/250 @ ISO800. Telescope: Celestron GPS11 at prime focus. A 9 day old Moon. Camera: Pentax IST *D Exposure: 1/750 @ ISO800. June 10th, 2002 @ Lake Pleasant, AZ. Camera: Pentax SF10. Exposure: Auto. Film: Ilford XP2-400 Black & White C41 Process. Telescope: Pierre Schwar 6" Reflector. 25mm Plossl mounted in camera adapter. 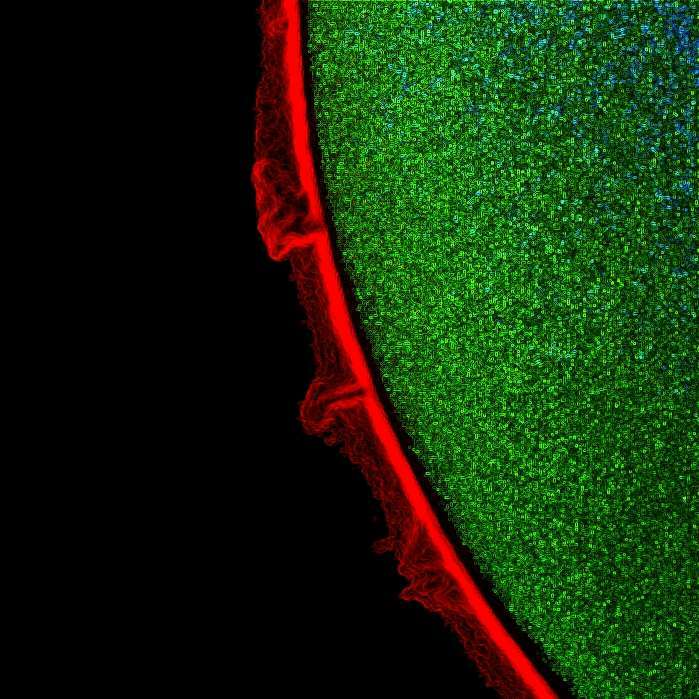 Solar filter attached. 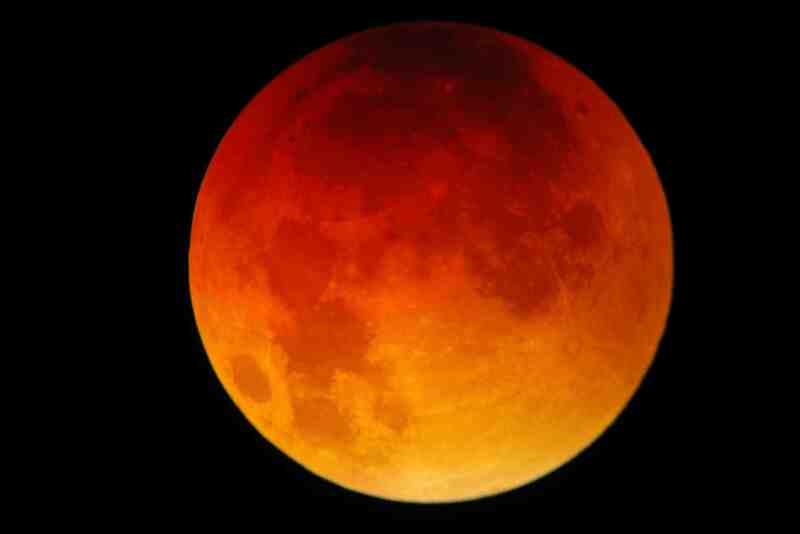 August 28th, 2007 Total Lunar Eclipse taken from the Mescal Spur Observatory, Clarkdale, AZ. 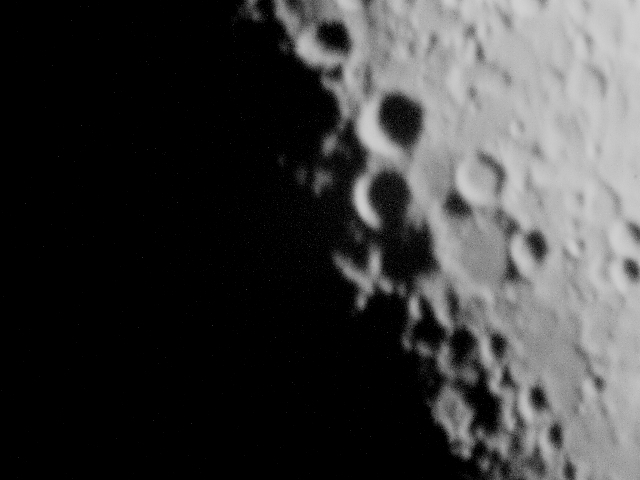 Pentax ist*D DSLR prime focus thru 14 inch SCT. 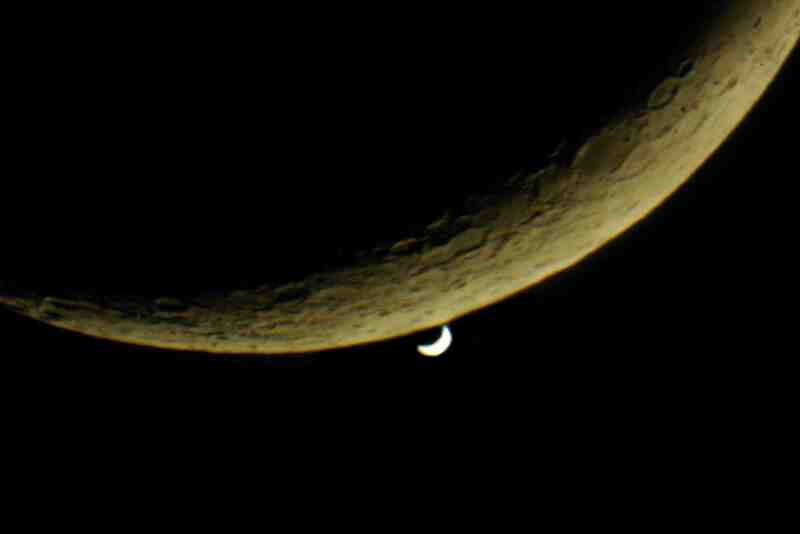 April 22nd, 2009 occultation of the inner planet Venus by the Moon taken from the Mescal Spur Observatory, Clarkdale, AZ. Pentax ist*D DSLR prime focus thru 14 inch Celestron Compustar SCT. At about 36 miles due east of the Mescal Spur Observatory lies the Discovery Channel Telescope. This Observatory is being built in conjunction with Lowell Observatory. 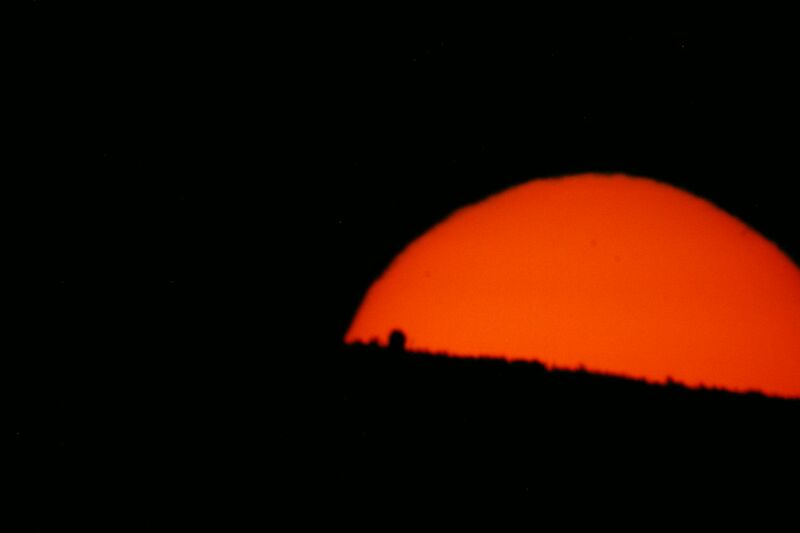 On March 20th, 2010 as the Sun rises on the first day of Spring, a silhouette of the DCT shows as a shadow on the face of the Sun. Camera: Pentax IST *D DSLR. Prime focus thru a 6" Celestron 6SE.